This Saturday, 24th November 2018, Brighton & Hove Black History will take guests on a tour of the city's Black historical landmarks on a new bus named after slave boy Thomas Highflyer. The Thomas Highflyer bus went onto the road on this summer following a special ceremony at Woodvale Cemetery, where Thomas is buried, to mark the 148 year anniversary of his death. "Brighton has been diverse for a very long time: it's a city that opens its arms to people. "We're proud to help the Brighton & Hove Black History celebrate the huge contribution black and minority ethnic people have made to the city over the centuries. "We hope their guided bus tour gives locals and visitors a deeper understanding of Brighton & Hove"s multicultural history, which they may not have known about before. "The Thomas Highflyer bus is named after a young African boy, who was rescued from slavery off the coast of Zanzibar and ended up living in Brighton. "We're so pleased to help the Brighton & Hove History Group bring his story to life on the inside of this bus, and especially pleased to include poems from current St Mark's Primary School children, which was Thomas's old school in the 1860s. Thomas will not be forgotten." Thomas M.S. Highflyer was a slave boy who was rescued from a slave dhow on in 1866, along with two other boys by Captain Thomas Malcolm Sabine Pasley of the Royal Navy's East African Anti-Slave Trade Squadron. He was sent to Brighton to be educated and lived at 19 Great College Street, Brighton where he lived until his premature death on 20 June 1870 at age 12. As part of a city-wide project, his grave has been adopted by Brighton and Hove Black History, who has restored the headstone. The group is now creating an educational project about his life. The Brighton & Hove bus features art work and information about Thomas' life, as well as poems and writing from school children from St Marks Church of England primary school, Thomas's old school. The Thomas Highflyer Heritage Bus Tour has offered 68 free places to Brighton residents, courtesy of Brighton & Hove Buses. The tour will be narrated by Bert Williams MBE D.Lit., co-founder of the Black History group, with additional material from Black History researcher Suchi Chatterjee. The tour will start at the Brighton Dome, where the group is later running its annual free Family Day from 12pm-5pm. 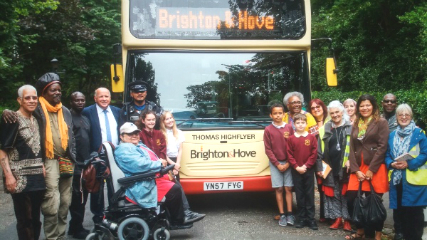 "The Thomas Highflyer project is a very important project for our Black History group and our bus tour on a bus named after him will help share the important contribution that Black people have made in Sussex for children, young people and adults alike." The project is funded by Heritage Lottery Fund in partnership with Brighton & Hove City Council and Woodvale Cemetery.